BMW has launched its new BMW Z4 sDrive35i Roadster in the Indian market, on October 12, 2009. The two-seater BMW Z4 sDrive35i Roadster, the top model in the BMW Z4 range, will be available in India at a price of Rs 59 lakhs (ex-showroom). “With the new BMW Z4 we want to reach out to new target groups in India who appreciate a pure driving experience, high standard of elegance and value, and suitability for everyday driving and comfort,” BMW India president Peter Kronschnabl said. The 2009 BMW Z4 sDrive35i Roadster is a stunning new model that comes with BMW’s 7-speed double-clutch manual transmission (automatic optional) and 2979 cc twin-turbo 3.0-liter 300-hp inline-six engine. The engine gives a maximum power of 306 bhp @ 5800 rpm and maximum torque of 400 nm from 1300 rpm to 3700 rpm. The BMW Z4 sDrive35i Roadster can go from 0-100 kph in 5.1 seconds with a top speed of 250 kmph. Another feature of the BMW Z4 sDrive35i Roadster is Dynamic Driver Control that allows drivers to choose from three different modes of driving, Normal, Sports and Sports+. The iDrive control system offers navigation features, entertainment, driver information, and telecommunications. The BMW Z4 sDrive35i Roadster has a retractable hard-top roof. The interiors of the sports car are classy with the steering wheel, dashboard, and controls done up in Ash Grain wood, brushed aluminum, and satin silver matte. Customers can also go for Ivory White leather seats or Kansas leather seats. The BMW Z4 sDrive35i Roadster will be a step up over rival Mercedes-Benz’s offerings in the Indian market. 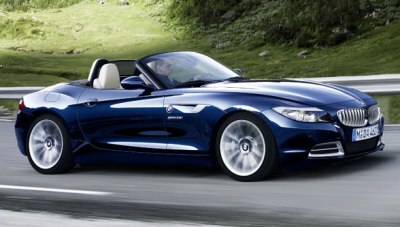 The company has said that it hopes to sell 30-40 units of the BMW Z4 sDrive35i Roadster in India, by the end of 2009. Reports say that BMW has sold 2,738 units in the country in January-September 2009, up from total sales of 2,908 units in 2008.